ST. EULOGIUS was a Syrian by birth, and while young embraced the monastic state in that country. The Eutychian heresy had thrown the Churches of Syria and Egypt into much confusion, and a great part of the monks of Syria were at that time become remarkable for their loose morals and errors against faith. Eulogius learned from the fall of others to stand more watchfully and firmly upon his guard, and was not less distinguished by the innocence and sanctity of his manners than by the purity of his doctrine. Having, by an enlarged pursuit of learning, attained to a great variety of useful knowledge in the different branches of literature, he set himself to the study of divinity in the sacred sources of that science, which are the Holy Scriptures, the tradition of the Church as explained in its councils, and the approved writings of its eminent pastors. In the great dangers and necessities cf the Church he was drawn out of his solitude, and made priest of Antioch by the patriarch St. Anastasius. 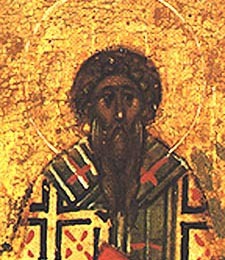 Upon the death of John, the Patriarch of Alexandria, St. Eulogius was raised to that patriarchal dignity toward the close of the year 583. About two years after his promotion our Saint was obliged to make a journey to Constantinople, in order to concert measures concerning certain affairs of his Church. He met at court St. Gregory the Great, and contracted with him a holy friendship, so that from that time they seemed to be one heart and one soul. Among the letters of St. Gregory we have several extant which he wrote to our Saint. St. Eulogius composed many excellent works against different heresies, and died in the year 606. Reflection.--We admire the great actions and the glorious triumph of the Saints; yet it is not so much in these that their sanctity consisted, as in the constant, habitual heroic disposition of their souls. There is no one who does not sometimes do good actions; but he can never be called virtuous who does well only by humor, or by fits and starts, not by steady habits.